It was difficult to choose to leave Roatan. I knew I would be packing up my snorkel for quite a while. I would be going far from a family, from people, I came to love. I was leaving a place of beauty that was comfortable and relaxing. But many more places remain for me to get to know so it was time to move on. I believe I will return to Roatan so that makes it easier. As we were boarding I noticed a woman wearing hiking shoes so I asked if she was backpack traveling. Yes, and her name was, well is, Sara and she is from Belgium. The guy she was with, Eduardo, also wore boots and was her boyfriend. The second guy was an island acquaintance, Arnold. Arnold is from Colombia and was in Honduras for work, on Roatan for vacation. I will see him again but he had to continue to San Pedro Sula. We all had a nice, smooth ride together enjoying good conversation. 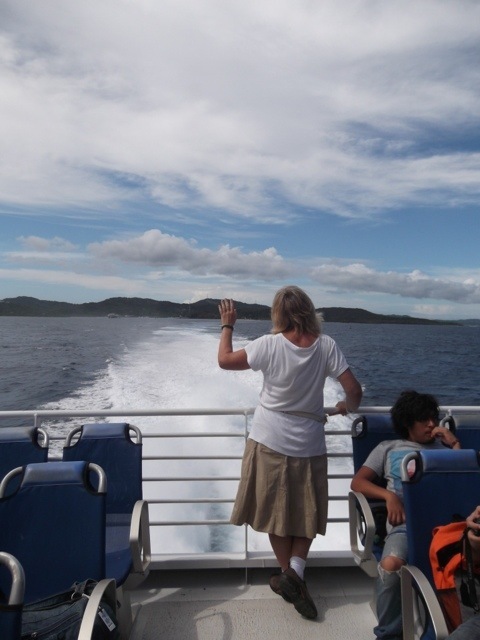 Saying so long, not good bye, to Roatan and my friends there. The four of us as we leave obesity full Roatan. 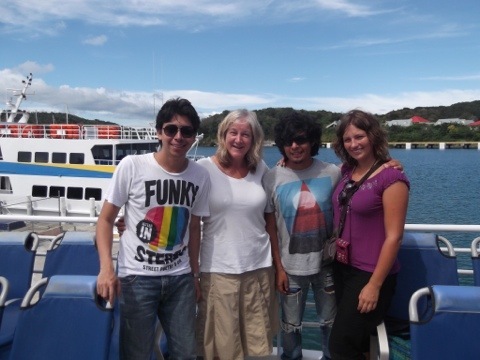 Upon arrival in La Ceiba, Sara, Eduardo, and I took a bus rather than a taxi, to the hostel. As always, the bus let me see more and gave me a bit of real life. It took a long time, and it got very hot inside when rains came and we had to close all the windows. I definitely thought at that point that it was so worth it to pay the very few dollars for a taxi. However, after the bus dropped us right in front of our destination, I was again happy to have ridden the bus. The three of us took a private room at the hostel, making that night nicer there. We then went put to a supermarket and I was thrilled to have such selection of foods.